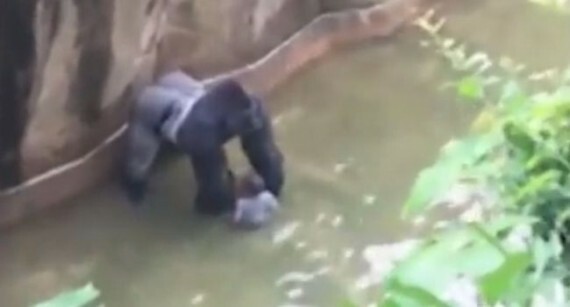 Since Maynard made his fatal and life-saving decision, hundreds of thousands of people have stormed the internet to sign petitions condemning Maynard for killing the Gorilla and demanding that the mother be charged with criminal neglect and be held accountable for the terrible outcome for Harambe. And what I find so ironic, and so telling about American society, in the public response to this incident is the fact that the outrage over the killing of the gorilla in many ways has been stronger than the outrage over the killing of the unarmed 12-year-old Black boy Tamir Rice. In 2014, in the nearby city of Cleveland, Rice was shot and killed after less than two seconds of deliberation by 26-year-old police officer, Timothy Loehmannin. Much media bandwidth, money, and bluster have been expended to defend the shooting of Tamir as an act justified by the necessity for the police defend themselves and others without hesitation from what they reasonably perceive to be a potentially lethal threat. But in my view, I see this as trying to sweep the true portent and causes of Tamir’s death under the rubric of the unavoidable accident, a regrettable artifact of society’s need to empower our protectors with the lethal means to fulfill their mission. But the arguments suggesting that the lethal force taken against Rice by the officers fail because the officers themselves created the encounter they viewed as immanently life threatening. In a counter-factual world, the older officer, a 46-year-old silverback veteran, would have led the rookie officer to not act so hastily and single-mindedly. They would have, in that very possible world, accessed information that was actually available to the dispatcher: that in all probability they were approaching a child with a replica of a gun in an open area where no one was close enough to be imminently threatened, even by an adult with a real gun. Most Americans would see no need, or even a sound rationale, for comparing these the two shootings in Ohio. The linking of African Americans to any talk about the great apes (Tarzan and racist tradition notwithstanding) is strictly taboo. I was recently shocked reading passages in Nobel Prize-winning Nigerian author Wole Soyinka’s memoir in which he calls his fellow Nigerian jailers gorillas and comments on their ugliness and dumbness. Racial etiquette aside, the two incidents I have linked here are just too immensely different to evoke meaningful comparison. The reality appears to be that both of the boy’s parents are unambiguously African American—and are under attack and painful public scrutiny. The father—whose extensive criminal history has been reopened to the air of media—has for years been living out the life of the hard-working family man we would want him to be. The mother, rather than being lax and irresponsible, as some have accused her of being, is an administrator at a pre-school. Of course, all of this leaves one major point so far not explored in the media—How was it possible for a toddler to get through the fencing? It seems that Director Maynard has some ‘splaining to do. Whatever is going on, somehow the media lost track of the obvious: this “accident,” like that the events that led to Tamir Rice’s death, was preventable and the Zoo should not get off the hook because of all the fog and hoopla about animal rights and responsible parenting.